A work of art put together by carefully chosen gems, gems with exceptional cut, clarity, carat and colour, all responsibly sourced and ethically produced. Also to be mentioned is that all the diamonds are certified as conflict-free. You can read more about this and the 8C Campaign created by Yana Zaikin on the website. Emily H London offers a fabulous bespoke service, a service which lets you be involved in every step of the process. Firstly, you would sit down with none other than Creative Director Yana Zaikin for a consultation to visualise your ideas. 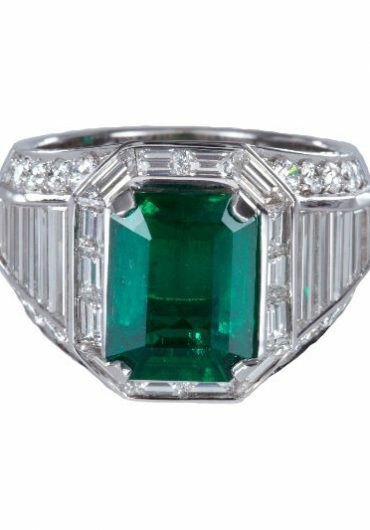 After agreeing on a budget and an initial design, the journey begins, starting with searching for those precious gemstones and sketching ideas that are taken from your unique initial vision. When all of this is found, the second consultation is arranged and you’ll have the important opportunity to work closely with your designer and get it just the way you want it. 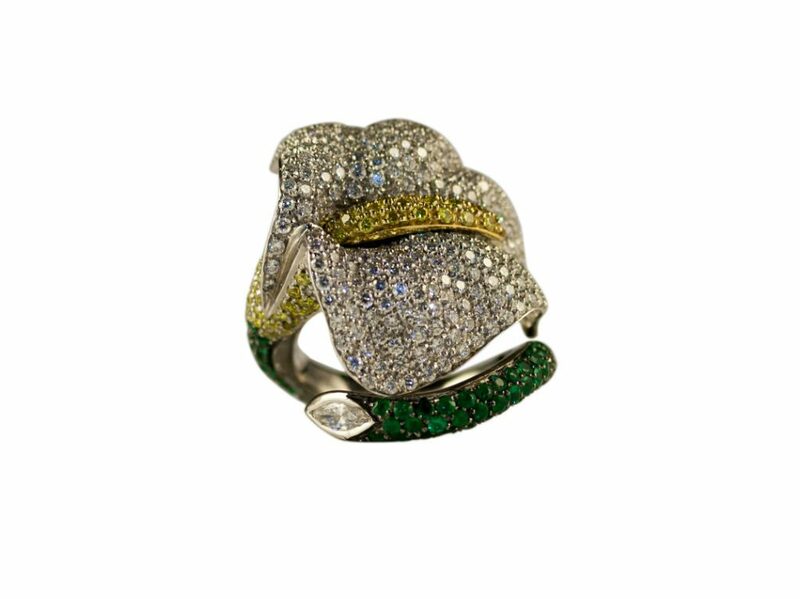 At Emily H London, they work very closely with their goldsmith in Rome who, with the help of technical drawings, creates that personalized bespoke piece for you to its last detail. This is such an amazing idea and it makes the piece feel so much more valuable. 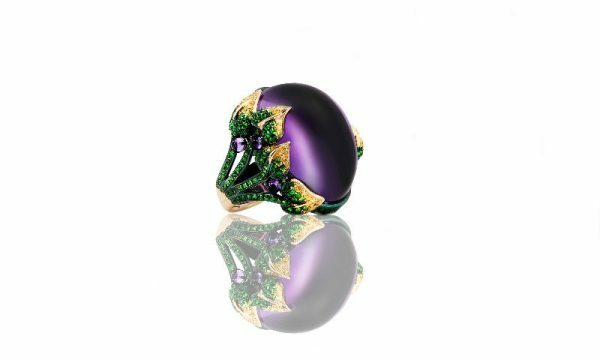 Originally, Emily H London was a commission based design service but has now grown into a fine jewellery house in its own right, with its debut collection Emilia, Eve of Milady and personalised men’s cufflinks. The first image that came to my mind when seeing these pieces was something from a fairytale, something like Snow White. They are enchanting and so unique. Vibrant colours presented through cabochon amethysts and cabochon citrines, surrounded by beautiful tsavorites and yellow diamonds. 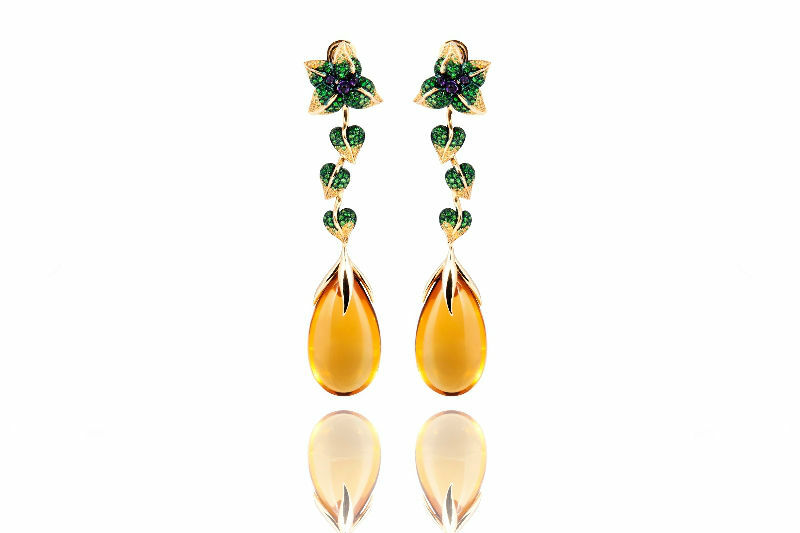 First, I’d like to share with you a pair of earrings from the Emilia collection that intrigued me. These are made so that you can change the look of them. 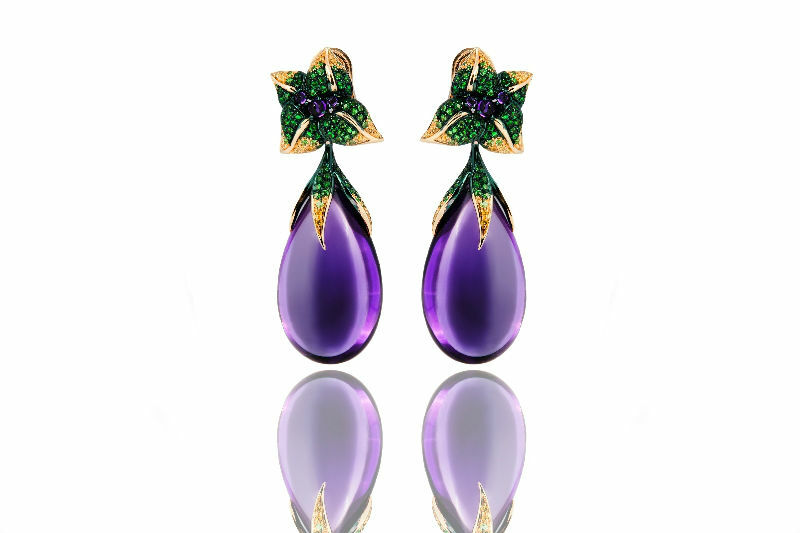 For your evening look, you can keep them as a longer earring with the top shaped as a large petal set with three small cabochon amethysts or tsavorites and the pendant of three yellow gold leaves set with tsavorites connected to a beautiful pendant. Or you can remove the pendant and just keep the lovely petal for a simpler look. So amazing with a piece that you alter, a beautiful limited edition. 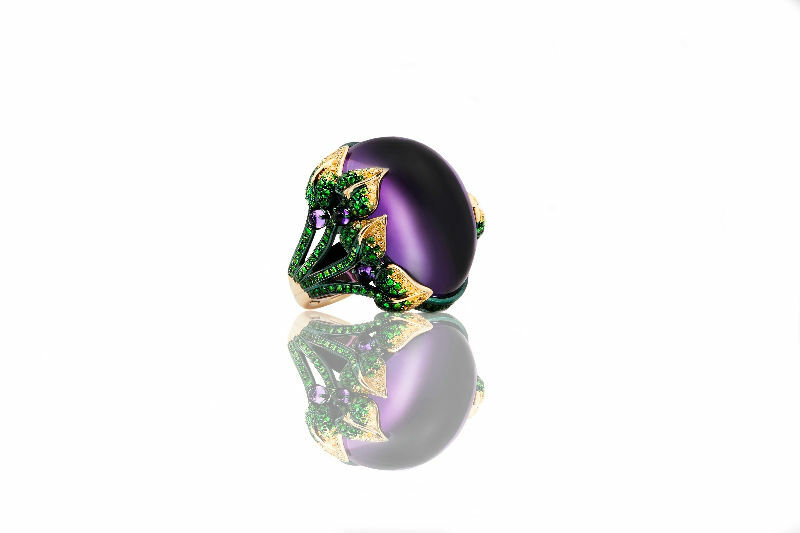 To add to this, you can find a ring matching the earrings, made of stunning 18ct yellow gold and an amazing centerpiece in the shape of a deep purple amethyst held in place on both sides with four, yellow gold leaves. The leaves are set with pave Tsavorites accented with five small cabochon amethysts. 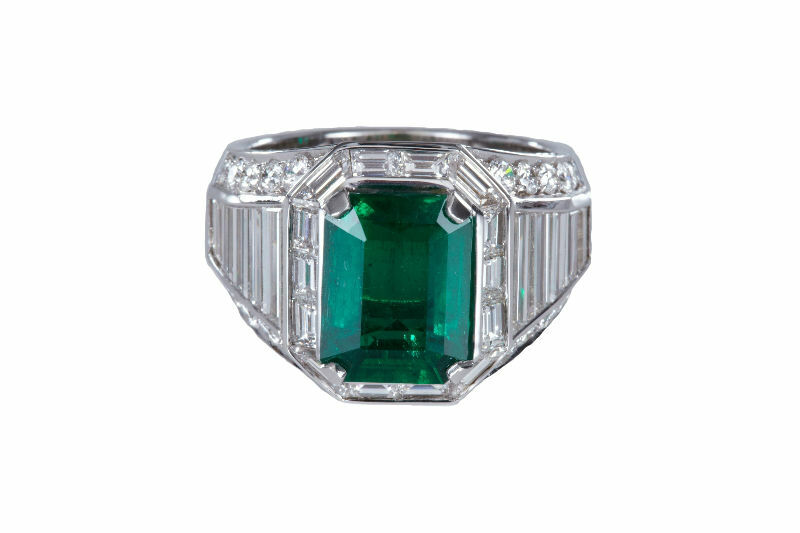 This is another limited edition – truly a ring you would find yourself lost in time admiring! 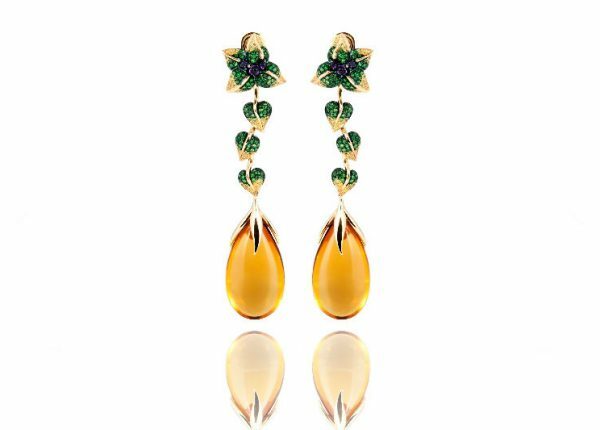 The Eve of Milady collection includes a pair of earrings with a stunning Old Mine colour Columbian emerald, topped off with dazzling 6ct diamonds. Why not add the completely stunning, classic shaped, ring to match? For the gentlemen, you’ll find the Celestial Collection, beautifully crafted unique cufflinks. Detailed but in a very balanced way, this will definitely give that perfect edge to a crisp suit. The first set of cufflinks is in a beautiful emerald gem found in Baja Mine, Brazil, surrounded by South African diamonds, while the second set is a bluish purple tanzanite gem also detailed with South African diamonds. 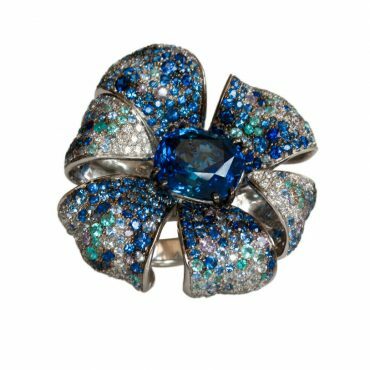 If you want that one statement ring, then something from the Flower collection is perfect. The collection is comprised of two amazing rings with unique shapes. 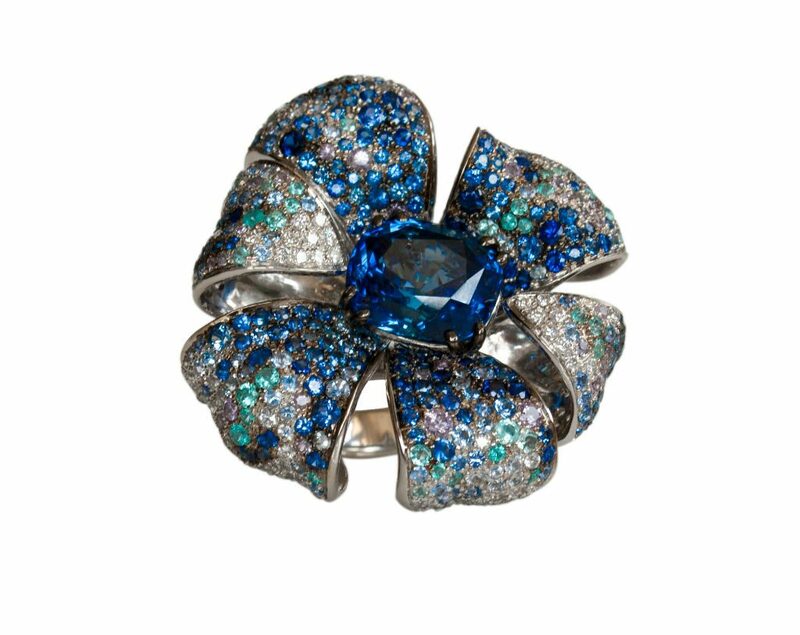 The first ring is the Blue Floral Sapphire ring, created by a rare natural unheated Ceylon blue sapphire paired with Paraiba tourmaline and accent stones in blue, pink, purple with sapphires and white diamonds. 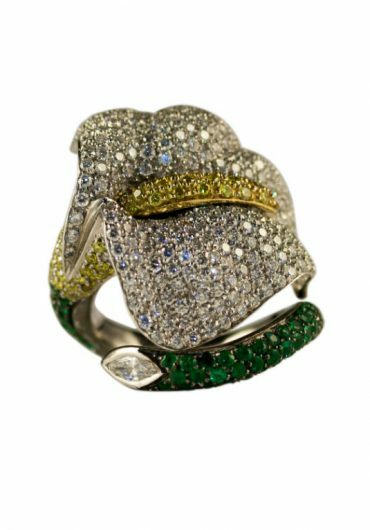 Alternatively, my favourite is the stemmed flower that graciously twirls around your finger decorated with emeralds, South African diamonds, white diamonds and Marquise diamonds, beautifully named Calla Lilly. As they say, “Diamonds are a girls best friend”, and they’re even better when topped with other beautiful gemstones. You can find Emily H London online.